Welcome to part 4 of 5 of our Divi mini series Creating Client Documentation to Empower your Clients and Save You Time. In this series, we’re branching out from a typical module or Divi design tutorial by showing you 5 ways you can create Client Documentation with the primary purposes of educating and empowering your clients and in the process, saving you time. Creating a custom dashboard will save you countless emails and phone calls from clients when they have information that they can access when logging into their site. This will give you the ability to update the dashboard with updates or the most recent information that your client may need to know. You can also use this to link to your extra services, products, etc. When your client is logging in and updating their site, a custom dashboard is a great way to make their experience more personalized. Instead of them needing to reach out to you for a response, most questions about Divi, WordPress and site specifics can be answered by putting links and resources into their site dashboard. There are several different tools and plugins to help you create a custom dashboard; I’m currently a free plugin called Custom Dashboard Page. With this, I’m able to create a page and put whatever information I want on it, then set it as the WordPress dashboard so my client sees this upon logging in to the site. A great way to personalize your clients’ experience is to create a custom walk-thru video of their site. 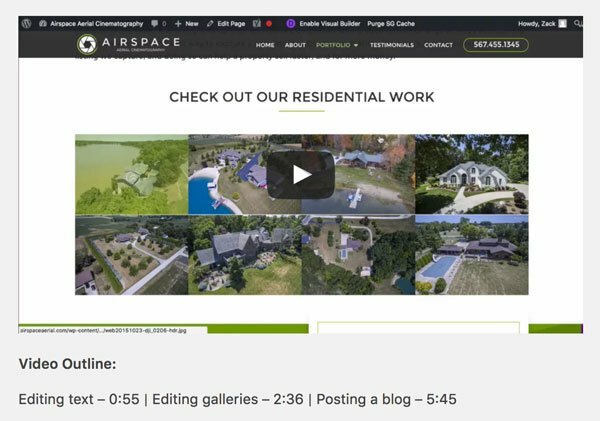 If they’re posting blogs, events or making site-specific changes, I’ve found that a tutorial style walk through video has tremendous benefits for the client who can refer back to it and for me the designer who can avoid questions that are answered in a one time training video. I’m currently using Screenflow For Mac to record my tutorial videos. In the custom dashboard, I’ll embed the video and create a video outline by minute/second as reference for the client. Here are a couple examples of how I’ll set up the outline for the client to easier navigate the video. Side note: I use Vimeo for these site specific training videos for the privacy options. A client wanting to update their site will inevitably have to know a little bit about Divi. I typically explain the basics to the client before turning the site over but it’s important to give them references if they have more detailed questions. The most important thing now is to give your client the resources they need and answers to their questions without them having to rely on emailing or calling you for every single question. You can find yourself in a support position very quick without educating your client thoroughly or giving them the resources they need. I’m currently using a very handy (and free) plugin called Divi Training WordPress Plugin that allows the client to access all of the official Divi tutorials beautifully organized and categorized all within their dashboard. This allows the client to get specific answers to their questions while logged into the site. The WordPress theme your site is built through is called Divi. It’s super flexible and quite frankly, awesome. The more you work with it, the more comfortable you’ll be when editing text, adding images, etc. You can access specific training videos and documentation on the different modules and options by going to Divi > Divi Training in the lefthand toolbar. Along with knowing the basics of Divi, a client who is updating their site will also need to know some basics of WordPress and the text editor. (which we know can be a bit tricky in WordPress) The verbiage I currently use is more of a disclaimer but there are numerous links, resources and tutorials you could potentially point a client to. The final area that I implement is a link to my Client Resources page, which we’ll go over tomorrow in our final post. This is essentially a teaser as to what they will get by viewing my client resources page. You now also have access to my “Client Resources” page that covers how to read and understand your Google Analytics, some basic SEO practices, creating a Facebook Ad campaign and more! In this video our video tutorial specialist Augustin Mak will create a custom dashboard using the information I’ve provided above. If you’d like to see how it’s done, step by step in Divi, then this is the video for you! Tomorrow we will take a short break from this series for our weekly episode of our podcast and video show, Divi Nation. But on Saturday we’ll conclude this miniseries by going over how to create a client resources page that will have valuable tips, tutorials and information that your clients can always refer back to. This has numerous benefits for your client but even more for you, the developer. You’ll find out why Saturday! Nice post josh 🙂 I also like to suggest ‘WP Help’ and ‘Easy Support Videos’ plugins. Thanks, Chathura! I’ll check those plugins out and will probably start including those in my custom dashboards! Great post Josh. I’ve been loving this miniseries and custom dashboards was something I’ve been considering doing but didn’t know where to start. Thanks again! Thanks, Dom! Glad to hear this series was an inspiration for you. Plugins you suggest are not compatible with wp 4.7.x and are not updated from 5 months. Did you know any tested pro plugin with the warranty of a professional and continuous update? Do you get warnings and errors in 4.7.x? A well written plugin can work for many releases in the future. Hey Fabrizio, I haven’t had a chance to check those plugins out but thanks for the heads up. I do typically make sure all plugins are 100% compatible before activating on any of my sites. I’ll have to dig around for some WP training plugins that are up-to-date. Cheers! Great Post and Series Josh! 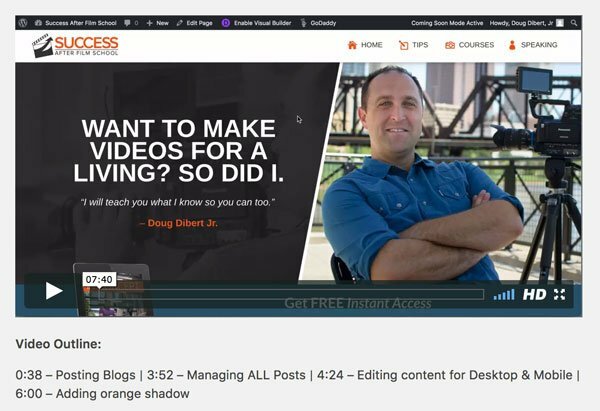 Thanks for included the Divi Training Plugin! Thanks, Joel! Your Divi Training plugin has been a HUGE help to me and my clients already. I am LOVING this series! Thanks, Josh. Custom Dashboard is nice, but I’d prefer to link to a private landing page. Thanks, Karen! Linking to a private landing page is a great idea as well! You can use any of the ideas from this series and certainly make them your own. Thanks for the feedback! Excellent recommendations, Josh. I particularly appreciate the “Here’s what I say” snippets. So handy. Love that you recommend WP101.com for WordPress basics. Our own WP101 Plugin looks very similar to the Divi Training WordPress Plugin. 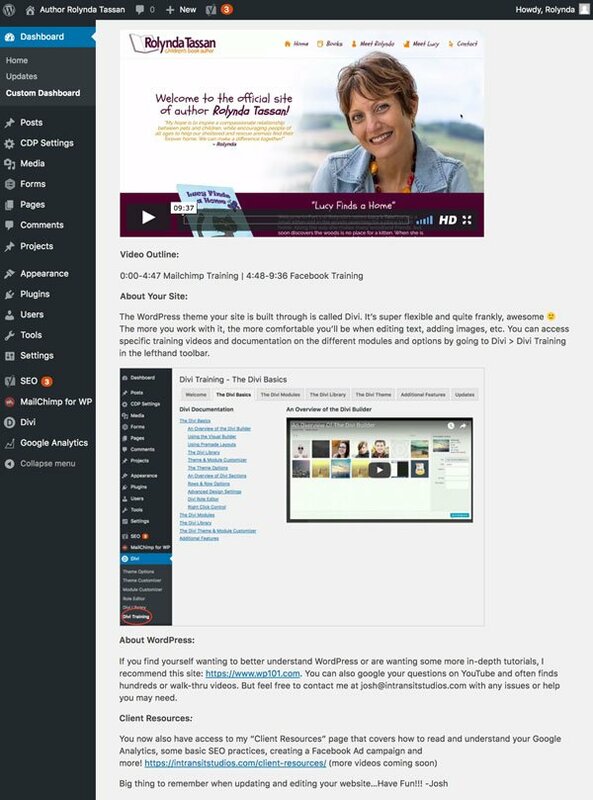 Wouldn’t it be great if we could merge the two and have our WordPress 101 videos appear in that plugin? Hmm… food for thought. That’s food for thought indeed, Shawn! Feel free to contact me via my site and I’d be happy to talk about that in more detail. Shawn, I’d love to talk to you about this idea. You may be on to something! Love this series that you are doing. Thanks for sharing your great secrets. Where do you put these pages? Are they just regular pages that you don’t link to in your menu or do you password protect the pages? Hey Jay, yea all these are currently just regular pages that aren’t on the menu. I just send the page link to the client depending on where they’re at in the process. Most of the information covered in the series so far is general information that ALL clients can use so I haven’t worried about making them private, but if there is ever any sensitive information or site-specific content I would definitely protect those. Their custom dashboard, not customers. Hey Penny, I’m not aware of anything like that in place right now but I’m in talks with the creator of the Divi Training plugin on creating something along those lines. If you’d like to keep in touch on that, feel free to join my Divi Web Designers Facebook group and we’ll be updating everyone when we have that ready! Hey, Josh and Penny, This appears to be on topic, as I tried using the Custom Dashboard Page plugin, but it does not support Divi content, so I gave up on it. However, I remembered a plugin by DiviLife that allows you to create a custom dashboard page, and it does support Divi and any site using the Divi builder. I installed it after reading this article, and I am very pleased with this plugin, it includes several premade layouts, so finally getting to the point, Penny could create and save pages to the Divi library, which you can share with anyone using the Divi builder. BTW, Josh, I love this series, one of the best and most helpful I have read anywhere to date. Your idea and examples are a vast improvement on my initial attempt to do something like this. I finally shelved my weak attempt at a client section until I could find a better way to do it, and using your examples will allow me to do just that. Hey James, thanks for your input on this and for the awesome feedback! I’ll definitely give that plugin a look. Sounds like that may be a great tool for what Penny and I talked about! Thanks, Christos! Appreciate your feedback! Thanks, Jordan! Great to hear. Awesome post Josh. Got the Dashboard plugin working easily on single installs. Not on working on my multisites even though it says multisite is supported. Maybe a plugin conflict. Anyway, awesome series, thank you! Hey Steve, yea that could be a plugin conflict for sure. I just (yesterday) heard about the Divi Dashboard plugin by DiviLife which is AWESOME and definitely worth checking out. Yes – this was quite worth the wait. Thanks for the tips Josh. The amount of effort you put in for your clients is awesome! Thanks, Aditya! I’ve learned the more you empower and educate your clients, the more doors it opens to new and recurring business, referrals and more! This is awesome – thank you! I have a related question – is there a way to set new posts to use the Divi Builder as the default? Thanks, Elizabeth! I’m not sure of a way to set posts to the builder automatically, but Divi makes it pretty easy by just clicking the “Use Divi Builder” button. Hope that helps! This series has been such a huge help in getting things organized. I have to admit I found myself in the “support” position too many times. This is going to really help me minimize that. I do have one question in respects to the videos for Divi. Have you found when you give your customers those videos they tend to play around with your design and take a chance of messing things up? Whats your take on that? I’ve never had a client mess with the custom dashboard page I set up. I suppose it’s always possible, but typically the only thing a client tends to mess up are the actual live pages on the site that they’re editing. I’d just let the client know that the dashboard page isn’t meant to be edited if it ever becomes and issue. Just found this series – got the email from ET on the last one but not the others and then found the whole series!! Brilliant posts in the series, very informative and generous and practical to actually implement – thank you! With Vimeo I am new it to (signed up after I read this post! ), can I ask please what package are you using please for your training videos please? will the basic package allow this? Doesn’t Youtube offer similar privacy settings? I only have a couple of clients who wish to do their own blog posts and most I find are not interested in updating their own site at all, however I will implement a dashboard so they can learn to do so if they wish. Also I am on a Mac too and for videos in the past (I have done blog training screen videos for clients) I have just used Quicktime. I am not a video editor by any means and ScreenFlow looks great, however is Quicktime suffice to start with? Thanks, Hill! I’m currently using the Vimeo Plus account which is only $5/mo. It’s fine for the amount I use it currently. YouTube is good too but Vimeo is more robust in it’s privacy options. You can actually hide videos completely from vimeo and just embed it. Quicktime is certainly a great start but I’ve really enjoyed using Screenflow and would highly recommend it. Thank you for this series! How can I make sure that the page will not be shown outside of the webpage whit Custom Dashboard page. Will the clientpage be visible inside to my customers if it is a draft? Hi Monica, you can make the page private so it’ll just be seen on the backend. I’m now using Divi Dashboard Welcome by Divi Life which has some security protections so the page can’t get deleted by the client. Very handy. Hope that helps! Thanks Josh for this series, that’s very interesting. Do you know if it’s possible to add plugins such as Google Analytics for WP ? in the page ? Thanks Adrien, I’m actually using the Divi Dashboard Welcome plugin by Divi Life now that you can use the Divi builder with. Then you can actually add the custom dashboard above things like Google Analytics, Recent Posts, etc! It’s awesome and highly recommended! I can’t find a way to enable it for the editor or author roles?